You have chosen the Versaday King James Version (KJV) SD memory card with a resolution of 800x600 pixels. Almost all Digital Photo Frames have an SD memory card port. 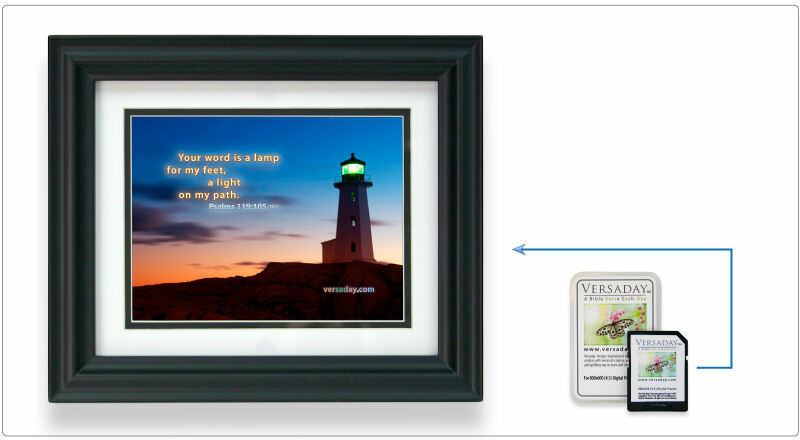 Versaday SD cards let you plug the full set of 365 unique Versaday scripture images right into your own Digital Photo Frame. Resolution is the number of pixels in an image (width x height). You can find out the resolution of your device by referring to its instruction manual. Or you can Google your devices’ Model Number + resolution.